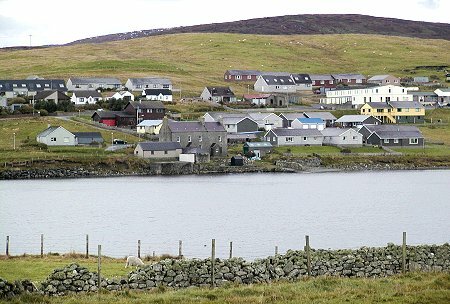 Brae is a relatively recent settlement lying at the northern end of Busta Voe. Four hundred yards to the north is the southern end of Sullom Voe. 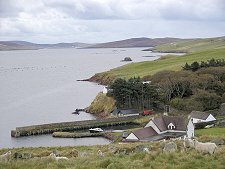 The first settlement in the area lay on the west side of Busta Voe. In 1588 Busta House was built in its imposing hillside location. 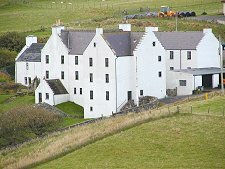 It was originally just two storeys in height, but in 1714 Thomas Gifford, the then laird, added a three storey mansion to the existing house to celebrate his marriage to Elizabeth Mitchell of Scalloway. Their arms can still be seen above the entrance. At about the same time, Gifford built a harbour below the house and set up a fishing station there. In 1748 their eldest son John declared his intention to marry his orphan cousin Barbara. His mother said she would rather see him dead at her feet than married to his cousin. Shortly afterwards John, his three brothers and two other men were drowned while crossing Busta Voe in a small boat from the harbour below the house, and John's body was afterwards laid at his mothers feet. It is said that she died of grief, and that her ghost still roams Busta House. Busta House was sympathetically extended in 1984 and is now an upmarket hotel. If you are looking for country house atmosphere while staying in Shetland, then Busta House is very probably the place for you. 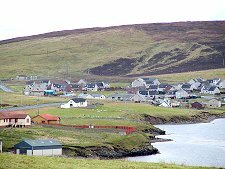 By the mid 1800s, Brae had emerged as a crofting township on the east shore of Busta Voe. Its growth was promoted by the development of a road through the village, and by 1894 it also had a weekly steamer service. 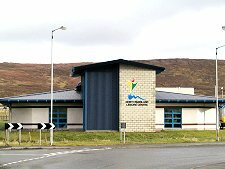 But Brae was still very small when in the early 1970s Europe's largest construction site got under way at Sullom Voe, a few miles to the north. Rapid expansion of a number of settlements in North Mainland followed, with Brae very much amongst them. The result today is a settlement that lies close to Busta Voe, but does not seem attached to it. Modern housing has been built around the earlier core, as have a number of community facilities. These include a school and the North Mainland Leisure Centre. You will also find a hotel here and a number of shops. Particularly worth mentioning, just west of the junction with the B9076 to Sullom Voe, is the general store that sells some of the best sandwiches you will find in the northern half of Mainland Shetland.